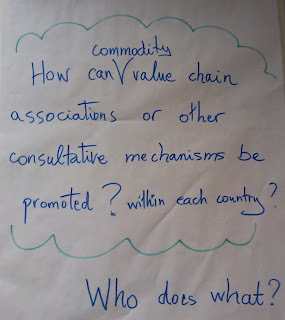 FAO's Agricultural Marketing Group invited me to help facilitate a workshop on commodity chain associations in South Africa last week. It was a great opportunity for me to get out of my books, journal articles, and from my computer screen so as to meet the people who work in the agricultural and food industries, and to try to understand the real, rather than theoretical, issues they face. 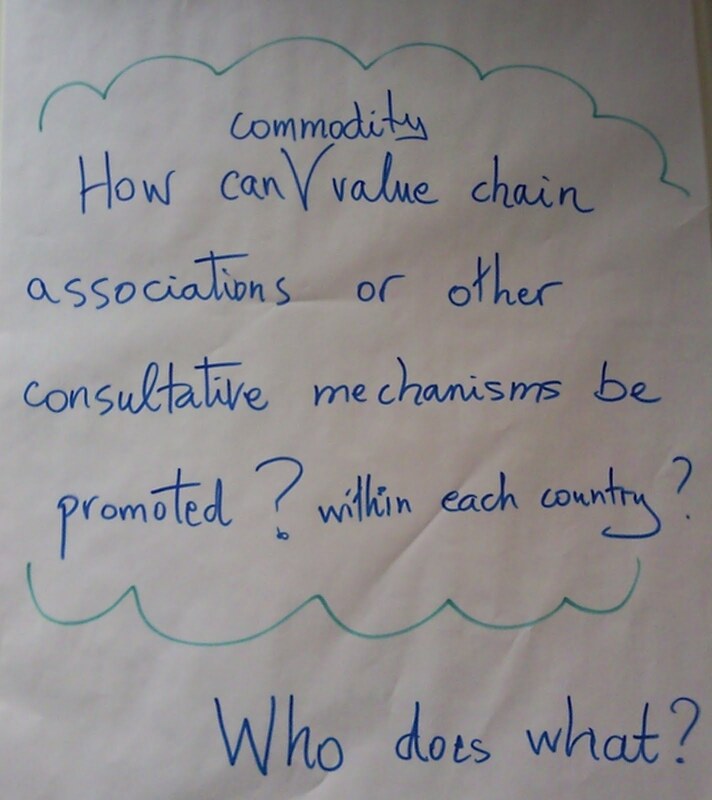 Last Friday morning I was given one hour and fifteen minutes to get a small group of eight southern Africans to discuss how to promote value chain associations in their countries. 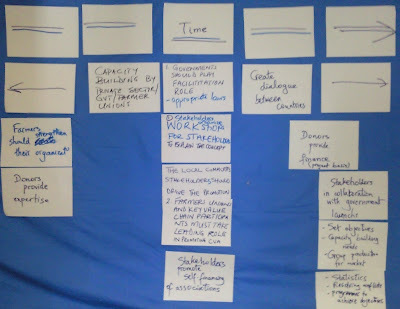 Given the relatively small group of generally talkative Africans and the limited time I had, I decided to use the Concensus Workshop Method to come to a common agreement in the group. 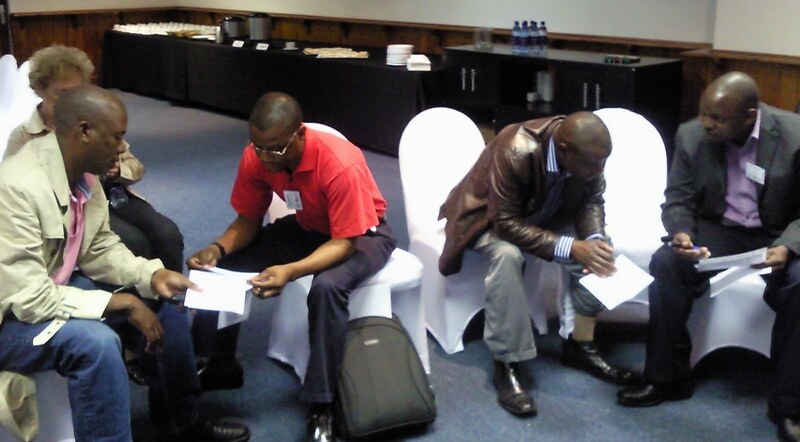 As for most facilitation exercises, the phrasing of the question to be answered was a crucial element. We first started by getting a common understanding of the question, which led to the addition of two items so as to make it clearer. 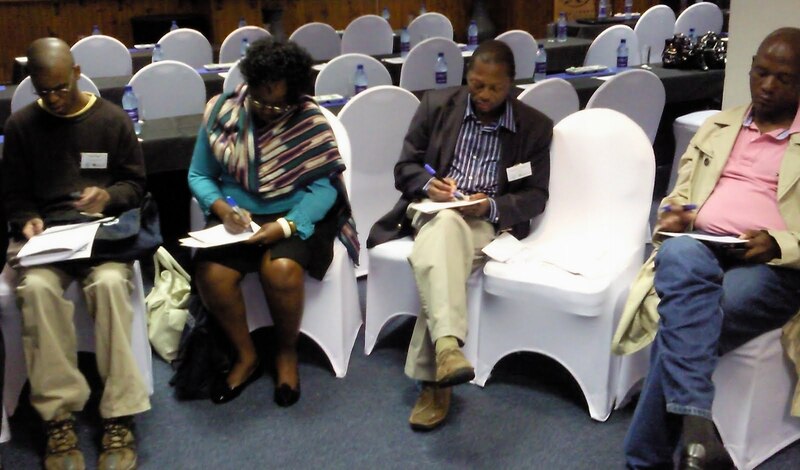 Then I invited the participants to jot down their answers to the question on separate cards. The next step involved the participants discussing their ideas in pairs. Given that I had four pairs, I asked each pair to select two responses they wanted to share with the group. This process allowed all members of the group to voice their opinions, even if they would have been naturally too shy to speak in front of all the other participants. The cards chosen by the pairs were then presented to the whole group and discussed. My delicate job as facilitator was to help the group classify their inputs without doing the classification for the participants! In this particular workshop, I suggested that the different activities being proposed by the participants be classified according to their place in time. I made this decision because it is very important in a development process to identify which activities should come before others in order to avoid raising unecessary hurdles in one's way. The result depicted below may be a bit obscure to understand at first, but all the group members had agreed on its logic and one of the group members restituted the result to the satisfaction of his group peers during the plenary session. In a quick debriefing session afterwards, the group participants shared that they "liked the method", "it allowed all participants to contribute", "it was very innovative". The rapporteur from the other working group mentioned before she presented her group's outputs that they unfortunately did not have "this technology". The Concensus Workshop Method is primarily useful to come to a group concensus in a relatively short time. The method suggests a concensus can be reached in just 45 minutes. However, the group size should not go over 12 and efficient facilitation is essential. I undertook a whole week of training followed by three days of facilitation before I considered myself confortable with it. I particularly like this method because it allows all participants to speak at some point in the process. This helps in groups where some individuals are naturally reserved while others have a tendency to speak just for the sake of speaking, and occupying precious time. As they have already spoken to their immediate neighbour in the pair work, I have found out that such "talkative" individuals do not show so much the urge to be heard by the larger group. I must admit I still struggle keeping a completely neutral attitude to the topic being discussed. I often tend to suggest classifications for individual items a bit too forcefully on groups and rewriting some cards myself for the sake of gaining time. In the ideal situation, all ideas and all cards should emerge from the group's participants without the "help" of the facilitator.